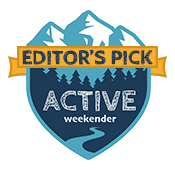 You may be surprised to learn that snowboarding has eclipsed skiing with participation almost equaling that of cross-country and alpine combined. Most users are under 30 and male. And there’s no denying the adrenaline rush it offers which probably explains the demographics behind the sport. But with the popularity of Olympic snowboarders like Chloe Kim, more women are joining the shredding action. Snowboarding isn’t a cheap sport which becomes evident when scoping out boards. You can expect to pay anywhere between $100 and $2,000 or more for a quality model. This piece of equipment decides your experience. Therefore, you should plan on getting the best quality board for your budget. The other gear won’t approach what you’ll need to spend here. Quick Answer: What are the best snowboards for beginners in 2018? Snowboards have changed dramatically as the technology has improved. You’ll see it reflected in the price. Some features may not make a big difference when you are starting out in the sport. We’ll point them out nevertheless, so you can make an informed decision about your purchase. The Rossignol Circuit Wide Snowboard combines elements suitable for beginners with some added features to make your ride fun. It has a wood core with an 80/20, rocker/camber blend profile that combines the best of both worlds. That gives it great turning ability to match your increasing experience level. It’s definitely in the category of a beginner board. The board comes with a one-year warranty. It has a 1320 Extruded base to keep it affordable without sacrificing performance. It has ABS sidewalls for added durability. Some users may prefer a board with less flex. Some may outgrow its features and prefer something more responsive as their skill set develops. The Rossignol Circuit Wide all-mountain snowboard is a slick-looking board with some nice features at an affordable price. Overall, this is one of the best beginner snowboards for the money. It’s a great deck to learn on without gaining too much speed on the powder. 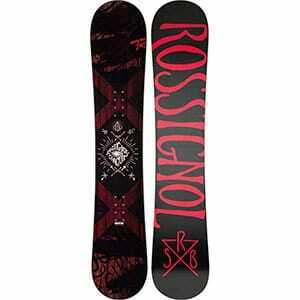 And it’s one of our favorite decks when it comes to the best entry level snowboard for carving. The Arbor Foundation Snowboard is another great-looking board with a clear coat topsheet to let the grain of the poplar shine. It has a rocker side profile for smoother landings. The all-mountain model has super soft flex. It has a shorter tail to make maneuvering in powder easier. The board is made of 100 percent sustainably grown poplar, making it an eco-friendly option. The design makes it versatile for a variety of terrains and snow conditions. Intermediate users may find it too soft and flexible for their tastes. The Arbor Foundation board is a lightweight board with a lot of flex that beginners will appreciate for its easy control and versatility. Score ample edge hold for making big drops and carving at speed with the entry-level Arbor Foundation men’s snowboard. It’s an all-mountain board made with beginner and intermediate riders in mind. The Vikeepro Standard Snowboard Men’s Snowboard is a lightweight, budget-friendly model. It’s not a fancy board, but it ticks the boxes for what a beginner would want in an entry-level snowboard. It’s flexible yet durable. It has a traditional style camber side profile. You can still stretch your wings and do some fun tricks with this one. It has a sintered base for better performance at a decent price. It’s made of fiberglass to handle some rough use. It has extra protection against UV radiation and warping. Some users may not like the over-the-top graphics on the board. 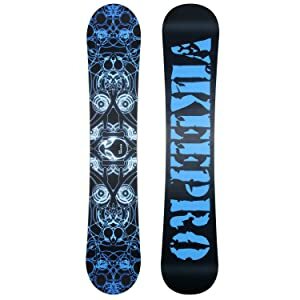 The Vikeepro snowboard is a good value for the flexibility and durability that it offers. Features a jib-friendly, torsionally soft flex and forgiving, park-friendly feel. The Arbor Ethos Rocker Snowboard features Arbor’s standard wood core, but it also has glass fibers in the laminate that give it a welcome boost of strength. It has a clear coat topsheet to protect it from UV damage and a rocker side profile. Overall, it’s a solid board that is durable yet flexible enough for someone starting out in the sport. And it’s one of the best snowboards for powder on the market right now for women. Like other products in the Arbor line, it is made of 100-percent sustainably harvest poplar. Despite the fact that it’s a beginner board, you can do a lot with it with spins and other tricks. The board is a bit more expensive than other entry-level products. The Arbor Ethos is a decent, entry-level model that is designed for women new to the sport and offers a lot of versatility. Arbor Ethos Rocker is a well-made, entry-level women’s snowboard for those who want to get better and go beyond. Now’s the time and here’s the board to elevate your skills and shred like never before with the best beginner’s snowboard for women. The Lib Tech Skate Banana BTX Snowboard isn’t for everyone. But it’s worth a look if you want a board to see you through from beginner to an intermediate user. It features a camber-rocker-camber profile. It’s an eco-friendly product with a wood core and an eco-sublimated topsheet. It’s made with aspen which is known for its strength. The board is both an all-mountain and freestyle type for superior versatility. Easy-riding original Banana base contour (i.e., rocker between your feet) is excellent to learn on and aids progression. The board is kinda expensive for an entry-level model. Some new users may find it challenging to ride in the beginning as it is designed more for intermediate to advanced riders. Some may not like the yellow color, but at least you’ll be able to find it if you crash. The Lib Tech is a great value if you think you’ll like the sport and want to invest in a better board right from the start. Made for ripping, the men’s Lib Tech Skate Banana BTX snowboard is that amazing first board that never grows old in your quiver. It takes an ordinary shred day and makes it bananas fun. Snowboarding may seem like a passive sport, but nothing could be further from the truth. You’ll need to engage your lower and upper body as well as your core to stay balanced and upright on the board. That will involve a lot of larger muscle groups that you’ll need to work to get the best experience. The exercise is intense, burning 422 calories per hour for a 150-pound person. To put that in perspective, that’s the equivalent of two four-ounce burgers minus all the extra toppings. It’s a serious workout for someone who wants to lose weight and is willing to put in the time and effort to learn. After all, there’s no shortcut to losing the pounds no matter what others might say about special diets or supplements. It’s all about the math. Snowboarding a couple of times a week will put you well within the recommendations of 150 minutes of moderately active exercise. If you bump up the intensity, you can halve that amount. That will provide mental and physical health benefits to improve your wellbeing. Being outdoors adds to what you get from this form of exercise that goes beyond the calorie burn. Snowboarding is a gear-intensive sport. The board only scratches the surface. You’ll also have to purchase boots, bindings, protective gear and outerwear. You can buy your board setup as a package or separately. We suggest the latter to fit it to your ability and style. If you go that route, you should get your boots and bindings before the board. Variations of these features lend themselves better toward the best snowboards for beginners. Until you get the experience under your belt, you should follow this path to make the most out of your purchase. By use, we mean the terrain where you’ll probably go snowboarding. It could be groomed runs or the backcountry and everything in between. Also, consider the type of snow whether it’s powder or packed. These conditions will impact the performance of a snowboard and make some features more desirable. Finally, be realistic about your ability. There’s a lot of specialization in snowboards, especially at the intermediate and advanced grades. The terrain will come into play when choosing which type is best for you. Beginners will do well with an all-mountain model because it’s versatile and able to handle most conditions. It’s by far the most popular choice. You’ll also see freestyle boards for those who want to do tricks and jumps at a park. That’s trending more in the intermediate skill level. Finally, there are splitboard models that can function like cross-country skis if you’re bushwhacking in the backcountry. Next, find out the length that is appropriate for your size. The easy way to determine it is to measure the distance from the ground to your chin in centimeters. That’s a guideline but not a hard-and-fast rule. You’ll see sizes listed in ranges. For example, a beginner should focus on the lower end. However, if you’re heavier, a longer board is a smarter choice. The width depends on your boot size. That’s one reason why we suggested getting them first. The ideal setup is one where your foot will just go slightly over the edges while not interfering with your ride. You’ll see sizes for narrow, regular, mid-wide and wide, depending on the manufacturer. The terms camber and rocker refer to the profile of the snowboard if you view it from the side. It’s one example of how the technology has advanced with the design. A camber board has upturned ends with a slight upward curve in the middle or waist. That gives it stability and responsiveness for speed and a nimble ride. A rocker board is the opposite with a concave curve. You’ll also see them called reverse-camber. They are excellent choices for beginners because they have a lot of flex and will perform well in powder. Other types you may see include flat and a plethora of variations on the rocker theme. A snowboard may have flex through its width and length. It could be either soft or stiff. The former is a better option for beginners because it’s forgiving. You’ll also find it easier to maneuver. The latter works well in backcountry terrain and for snowboarders who want a board for speed. You’ll often see it listed in terms of a grade like soft, medium or hard. Other times, it’s listed as a number between 1 and 10 with 1 denoting the softest. Like other features, there is a tradeoff with flex. It’ll matter more to the experienced user than the beginner. Advanced snowboarders may refer to a board feeling mushy and having trouble popping or getting airborne. It comes down to personal preference and your ability. A board with greater flex is slower than one that is stiffer. For a beginner, it’s not likely that it’ll be a game changer. You’ll find four basic shapes for a snowboard. It will affect how it handles and how responsive the board is in different conditions. The directional type is the most common and best suited for beginners. It allows for riding in one direction. While the nose is softer and more flexible, the tail is stiffer for better performance. While the ends differ in the directional, they are the same in the true twin shape. They can go in either direction which makes them a good choice for someone who is more comfortable on a snowboard. The twin directional board combines the features of both. You may also see asymmetrical models have different shapes on either end for easier turning. You’ll see bases listed as either extruded or sintered. The difference boils down to weight, maintenance and performance. The former is a more budget-friendly option that is easy to maintain. The latter is lighter and more expensive. It also requires some extra upkeep with waxing due to its porous surface. Board often include a variety of materials in their core and on the exterior or topsheet. You’ll find models made of different woods such as aspen or polyethylene. Others include more high-tech options like graphite or gallium. The type or types affect the durability. The cheaper extruded ones are quite durable. The tradeoff is speed and glide. You’ll likely find other specs for a snowboard that speak to its maneuverability and turning ability. For example, the sidecut radius gives you an indication of how sharp a turn you can make on a board with shorter figure meaning a tighter circle. You’ll see it given in meters with the number increasing with the size of the board. Another term you’ll see is the effective edge measured in millimeters. That refers to the length of the board that is in contact with the ground. It is not the same as the length as the ends have different shapes. Again, it increases with the length of the board. A larger number means more stability while a smaller one is more responsive for turning. Our best advice for beginners is to start slow. 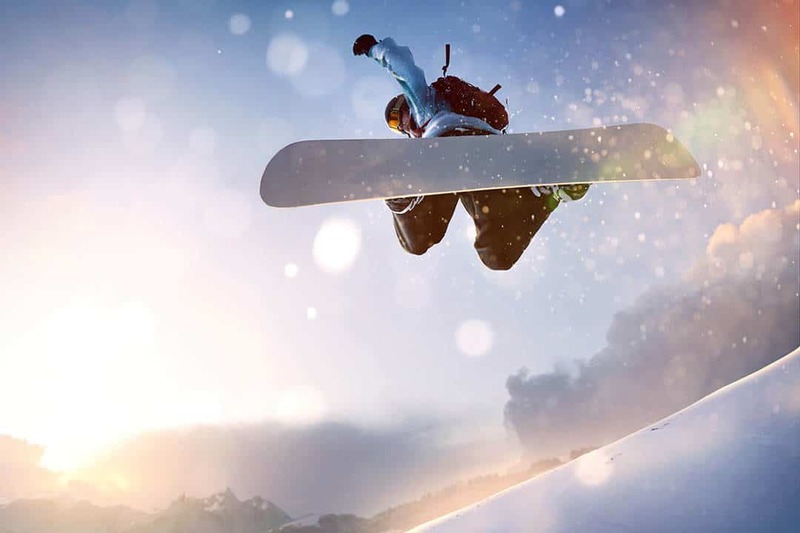 While injuries are more common with downhill skiing, the ones involving snowboarding are often more serious. And novices have the greatest risk of getting hurt. Always stay alert to your surroundings and other people in the area. And we can’t emphasize enough how crucial it is to wear a helmet at all times. It’s a smart idea to inspect your snowboard and its bindings every time before you hit the slopes. Check your boots and helmet for any damage too. When you are snowboarding, stick within your ability. More injuries occur when people go faster when they have less time to respond. Snowboarding is an excellent way to get into shape and experience winter in new and exciting ways. The right board can make it even more enjoyable when it matches your style and the terrain. There’s no denying that it’s a serious investment which is why it is so vital to know what features you need to get the most out of your purchase. The best snowboard for beginners to intermediate will provide many hours of thrills and enjoyment. Remember to ride responsibly so that everyone stays safe. See you on the slopes!